I don’t care if you’re a Democrat, Independent or Republican, by now chances are you’re sick and tired of hearing about the upcoming elections. Well, lucky for us there is a fun - and I can tell you, a VERY FUNNY novel for political junkies. 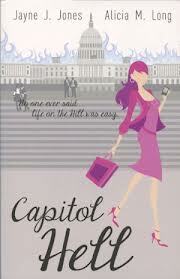 It’s called CAPITOL HELL and it’s about a gal working for a fictitious Senator based on my real-life neighbor, Minnesota Republican, Norm Coleman. Co-authors, Jayne Jones and Alicia Long worked on Coleman’s 2002 Senate campaign and for several years after as DC staffers. Those of you in the Land of Ten-Thousand Lakes will instantly recognize the fictitious Sen. Anders McDermott III, everyone else get ready for a sizzling page turner. Politics is politics anywhere you play it, especially “inside the beltway.” No one ever said working on the hill was easy, but recent college graduate, Allison Amundson certainly isn’t home in the Midwest anymore. She’s hired as the senator’s scheduler and now she belongs to whoever is calling or texting her on the campaign Blackberry 24/7/365. That includes the Senator, his staff, and family, as well as the nanny. Allison’s co-workers include a small circle of people whose job it is to jump, sit, run, and write and in some cases end up crying to make sure Senator Anders McDermott, III’s life flows effortlessly. The McDermott office motto is “ATD,” for Attention to Detail, which Allison is often reminded at various decibel levels. Allison finds comfort in fellow Midwestern co-worker and new BFF, Janet, who is also shell-shocked to find she’s working inside what could pass for a carnival. This novel isn’t your typical chick-lit. At one point, or actually, several, Allison tries to strike up a relationship with one of her co-workers, but that isn’t possible because the only real relationship she has is with her job. Since I once was in my early 20s and had a prestigious pressure cooker position such as Allison’s, I can appreciate her focusing on her career. I really enjoyed reading CAPITOL HELL, going behind the scenes and the little bit of flirting here and there was enough for me. What about all the antics performed by the politicians, their families and even nannies? Come on, it’s fiction, and it certainly provides a lot of comedy. Special thanks to Kelsey McBride PR for the book in exchange for an honest review. We'll also be giving away a copy of Capitol Hell during tomorrow's interview. (US only.) Remember to VOTE, if you haven't already done so!